UPDATE 9/14: Darryl Matlock pleaded guilty to the charges against him Monday morning in Greene County Common Pleas Court. Matlock will be sentenced Oct. 1 by Judge Stephen Wolaver. XENIA — A Trotwood man allegedly involved in an armed robbery and leading police in a brief chase in May, is set to go to trial for that incident Monday. The trial for Darryl Matlock, 19, will take place in Greene County Common Pleas Court under the supervision of Judge Stephen Wolaver. Darryl Matlock, 19, was indicted by a grand jury in June on seven charges related to a car-jacking incident: first-degree felony aggravated robbery, third-degree felony having weapons while under disability, third-degree felony grand theft, fourth-degree felony grand theft of a motor vehicle, fourth-degree felony carrying concealed weapon, fourth-degree improperly handling firearm in a motor vehicle and fifth-degree attempted grand theft of a motor vehicle. According to Beavercreek police information from the time of the original incident, Matlock pistol-whipped a victim in Xenia and stole that individual’s car. When law enforcement officers attempted to stop the vehicle on U.S. 35 in Beavercreek Township, Matlock avoided them but went off the roadway and blew a tire. According to Grile, Matlock tried to enter a vehicle on both sides of the U.S. 35 before attempting to elude officers. Officers took Matlock into custody after a brief foot pursuit. Police also reported at the time that Matlock dropped a weapon in the median at one point and that another gun was found in the vehicle he abandoned. Matlock was sentenced for criminal misdemeanor charges in 2014, including disorderly conduct, aggravated menacing and criminal trespass, according to Dayton Municipal Court records. The May incident shut down lanes on U.S. 35 after police apprehended Matlock. 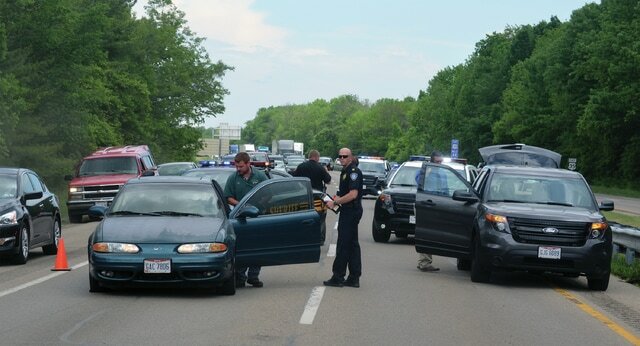 http://aimmedianetwork.com/wp-content/uploads/sites/32/2015/09/web1_car.jpgThe May incident shut down lanes on U.S. 35 after police apprehended Matlock.